A recent assignment with local government brought home the challenges of introducing digital, agile and service design into a traditional service provider; into an environment that’s neither digital first nor by default. In the UK local statutory services have endured many years of restructuring and funding cuts, whilst demand has steadily risen and technology has evolved. Though digital brings opportunity, realising it isn’t helped by changing legislative requirements, traditional models of service delivery, continual reorganisation, waterfall project management, and technology outstripping procurement. Lined up against these are caring public servants armed with workarounds, special relationships, and decades of experience. The Gov.uk service manual describes a staged gate process for developing and delivering digital services. Checkpoint assessments need to be passed before a service can advance to the next phase. Part of the role of this external assessment is to cut through any internal agendas that might be adversely affecting development. It also helps ensure that everything that should be done has been, or else there’s a good reason why not. Within these phases teams are expected to be working in agile sprints, continually testing and iterating. With so much already done toward digital government, there’s arguably little to be gained from reinventing the wheel without good justification. For most services it’s likely something similar is already out there which discovery research should identify. There are 418 principal councils, employing over a million people and with a budget of £44bn, all serving similar needs (local democracy think tank). How then could it possibly make sense to start from scratch with how a citizen should report a pothole or which responsive HTML grid to use? Any kind of research needs to begin with looking at what is already known and been done: it helps to move thinking forward and saves time. But even with a good example to follow, a lot of work remains. Making a wheel fit another bike can be a challenge: planning, critical assessment of resource and requirement, decisiveness around what to lose, keep or adapt, iteration and patient fettling. None of which is as glorious as having one’s own idea adopted, but then as Edison said, “Genius is 1% inspiration, 99% perspiration”. Social constructivism is a sociological theory that describes how meaning is negotiated and shared by collaborating upon artefacts, and generally doing things together. It’s a helpful approach to take with user research. Research is “academic” (not practically relevant) if it doesn’t tangibly affect a service or product: if findings aren’t reflected in the codebase. Involving the team mitigates against this: collectively formulating questions, preparing what’s to be tested, observing research and analysing results together e.g. contributing to scripts, artefacts, and collectively deciding what to do as a result. Jared Spool is a renowned UX professional and pundit who advocates for the importance of engaging teams in research (observing) He believes it is the single most important factor in delivering good user experience. 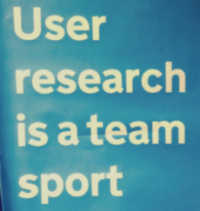 A position supported by the GDS mantra: “User research is a team sport“. It acknowledges that whilst digital might not obviously help with mending potholes (one of the most frequent inquiries), every service will increasingly have digital components. Importantly with so many examples of similar issues having been already addressed by other authorities, there seems little point in reinventing the wheel.